The world’s seven species of sea turtles have roamed the oceans for tens of millions of years. But today, most of these species are endangered and all are threatened due to unprecedented threats from humans, including fishing bycatch, entanglement, boat strike, poaching, loss of nesting habitat, pollution, oil spills, and climate change. The sea turtle research program at the Anderson Cabot Center for Ocean Life seeks to document the physical and physiologic effects of human interactions and natural phenomena on sea turtle health. We use advanced principles of veterinary science to improve the medical care of captive sea turtles. Our research team has pioneered advances in sea turtle medical and surgical management, rehabilitation, and transportation. Our work directly benefits sea turtles in our hospital, and our publications improve the care of sea turtles at other hospitals around the world. During major sea turtle conservation crises—including the Deepwater Horizon oil spill—we are solicited to aid in rescue and recovery efforts. Using technology such as satellite telemetry, our team works to understand the ecology of sea turtles in New England waters and the long-term fate of sea turtles released from rehabilitation facilities. The population of some sea turtles species, such as Kemp’s ridley turtles, has declined by 90% over the past 70 years. Each autumn, our sea turtle hospital treats hundreds of sea turtles that become chilled in cold New England waters. We are global leaders in medical management and rehabilitation of cold-stunned turtles. To date, we have treated and released 2,000 turtles after recovery from cold-stunning. The majority of these are critically endangered Kemp’s ridley turtles. During and after sea turtle recovery and rehabilitation efforts, it is often necessary to transport turtles long distances to appropriate release locations. We are studying the physiologic impact of such transports, such that we can develop best practices for reducing stress, maximizing the likelihood of survival upon release to the wild. The world’s largest turtle species, the leatherback, visits New England waters during their foraging season in summer and early autumn. They later migrate to the breeding areas in the tropics, often as far as South America. Leatherbacks are prone to boat strike and entanglement in fishing gear. 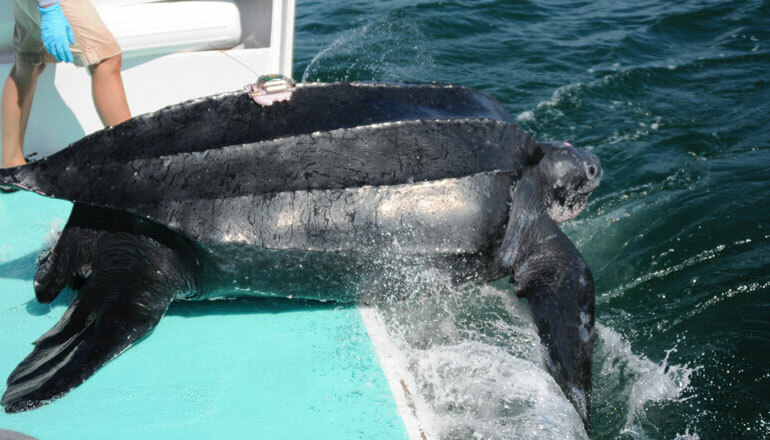 This project seeks to understand the basic ecology of leatherbacks in New England, and to understand the magnitude and effects of human interaction. By documenting these events and their outcome, we hope to develop methods to mitigate these often fatal interactions. This study is validating and evaluating the utility of thromboelastography (TEG) as a component of the medical evaluation of ill sea turtles. This technology evaluates various aspects of the blood clotting process. Preliminary results indicate that the normal process of blood clotting in sea turtles may be negatively affected by cold-stunning events, such that our patients may benefit from interventions that improve clotting. Injured or ill sea turtles often require antibiotic therapy, but there is limited information regarding the use of antibiotics in these species. This project is investigating whether the readily available antibiotic, oxytetracycline, can be absorbed well by sea turtles after under-the-skin injection, whether it is distributed well into their blood, and how long it stays present in their body at effective levels. Our preliminary results indicate that this simple method of injection results in effective drug levels for three species of sea turtles. This study seeks to understand the bacterial and fungal communities that live in the mouth, digestive system, and respiratory tract of Kemp’s ridley sea turtles. We are studying these communities for healthy turtles, as well as sick turtles that are being treated in our hospital. We expect this study to improve our ability to diagnose and treat diseases such as pneumonia, and to guide our selection and use of antibiotic therapy. Understanding the fine-scale behavior and energy expenditure of endangered sea turtles is crucial for effective management and species conservation, as well as for identifying and mitigating the impact of human activities. We are working with researchers at the USGS to attach satellite tags and acceleration data loggers to multiple species of sea turtle throughout the Southeast U.S. and Caribbean to study their broad-scale movements as well as their fine-scale diving, resting, and nesting behavior. This combination of devices allows us to identify how an animal’s swimming and diving behavior changes during different phases of long-distance migrations, and also allows us to quantify incidents of nesting and false crawls. This project also involves the development of a new, pop-off tag/float package that can be used to acquire data from juveniles and male turtles that do not come ashore to nest. Visit the Marine Conservation Action Fund (MCAF) page to see how the Anderson Cabot Center supports the sea turtle research of conservation leaders in developing countries.